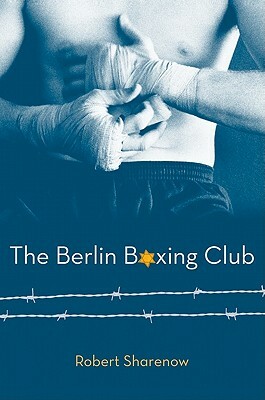 The Berlin Boxing Club by Robert Sharenow. Grades 7 and up. HarperTeen, 2011. 405 pages. Reviewed from ARC snagged at ALA.
Fourteen-year-old Karl Stern has never thought of himself as a Jew. But to the bullies at his school in Nazi-era Berlin, it doesn't matter that Karl has never set foot in a synagogue or that his family doesn't practice religion. Demoralized by relentless attacks on a heritage he doesn't accept as his own, Karl longs to prove his worth to everyone around him. World War II is a hot topic among teens and The Berlin Boxing Club is a welcome addition to library shelves. As Germany barrels along towards World War II, propaganda against the Jews increases and new laws make life harder and harder for them. Robert Sharenow brings these injustices to life through his story. Karl has to switch schools when his school expels all Jews and he has to sneak around with the girl he's courting because she's Catholic. By creating a Jewish family that's not religious, Mr. Sharenow emphasizes that the crimes of the Nazis were aimed at people of the Jewish ethnicity, not necessarily an attack on religion. Since Karl does not look Jewish, he's able to "pass" some of the time, unlike his father and sister. Karl's a character that teens will identify with and this makes these injustices all the more sour. Besides being a fascinating historical story, this is also a strong sports story. As Karl starts his training and gets better at boxing, he discovers a deep love and talent for the sport. The juxtaposition of the "civilized" violence of boxing in the ring against the senseless street violence against the Jews is a powerful one. More than once, Karl wishes that he could face his oppressors in the ring where there are rules and honor. Karl's boxing instructor Max Schmeling was held up as a symbol of Aryan superiority, especially when he bested African-American fighter Joe Louis in 1936. This is a source of conflict for Karl who is never sure where his mentor's allegiances lie concerning the Nazis. Pair this book with the 2011 picture book A Nation's Hope: The Story of Boxing Legend Joe Louis by Matt de la Pena, illustrated by Kadir Nelson for another perspective of Schemling and Louis's second fight in 1938. The book does have some pacing issues. The plot stops and starts a little instead of being a steady build. But for teens who have an interest in the time period, this won't be an issue. Karl's story will be enough to keep them turning the page. It's all the more heartbreaking since the reader knows what the characters don't: that the world is heading towards a terrible war. I'd hand this book to any teen who loves The Diary of a Young Girl by Anne Frank, Annexed by Sharon Dogar, or Between Shades of Gray by Ruta Sepetys. Check out more reviews at Stacked, Galleysmith and The Fourth Musketeer. You'll also want to catch Michelle's interview with Robert Sharenow and his guest post at Galleysmith. The Berlin Boxing Club is on shelves now!